If you invest in quality menswear pieces, you need to make sure that you are going to take good care of them. If you have priced out any custom closet solutions, you know they are not cheap. For the time being, you just need an affordable solution that makes custom build to store your wardrobe properly. The first thing you need in the closet is a lot of hanging space. The most economical solution you may find is a rack of wire shelves. You can adjust the spacing of shelves as tightly as you need. A good suit deserves a good hanger. This means one with a full shoulder that is properly fit to the point-to-point. As far as the pant bar goes, you can prefer a simple sling-over bar than a ‘squeeze bar’ which often leaves a wrinkle halfway down the leg. As with all hanging garments, give them enough space on the rack to breathe. If you squish too many garments on a small rack, they are all going to get wrinkled and you will have to break-out the steamer every time you change outfits. If you are storing off-season pieces for long term, keep them in garment bags to preserve them from moisture and moths. You can try to use wooden hangers as much as possible, but with shirts you can save on hanger costs. The wire hangers from the dry-cleaners will work just fine. Always keep those hangers as well as the plastic coverings. When you put a shirt on a hanger, make sure the top button is fastened to preserve the shape of the collar and keep the shoulders from sliding around on the hanger. Ideally you should button the entire shirt to keep the front panels from folding over and getting wrinkled. Always use cedar shoe trees. If you wear them very rarely, consider dust bags as well. 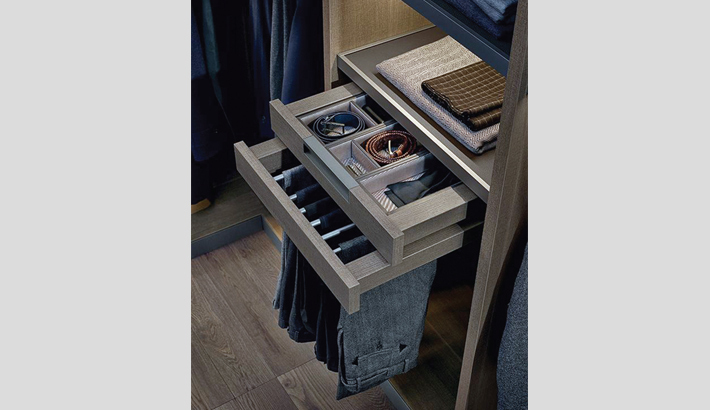 Rolling ties in a drawer is the best way to store them, because it keeps their fluff or dimension. But if you have scarcity of time to find them out, keep them hanging, slung over a cheap curtain rod, where you can see them all and quickly pull one down. Cufflinks, tie bars, tie pins, collar pins, and watch bands, etc. are important small accessories. Find a nice masculine looking jewelry box with different compartments, and keep all of these in one centralized location. You may wear an automatic watch most days. The problem is that when you stop wearing it for a day or two, it stops telling time, which is the biggest problem of an automatic movement. For this style of timepiece, you need a self-winding case, which rotates the watch in order to keep it functioning properly. Unless you want to wind it manually every time you wear it. Yet storing is not always enough for keeping attires perfect. Sometimes you need to concentrate on maintenance.